Jonny Bairstow struck his maiden ODI ton as England crushed West Indies by seven wickets in the rain-hit first ODI at Old Trafford. 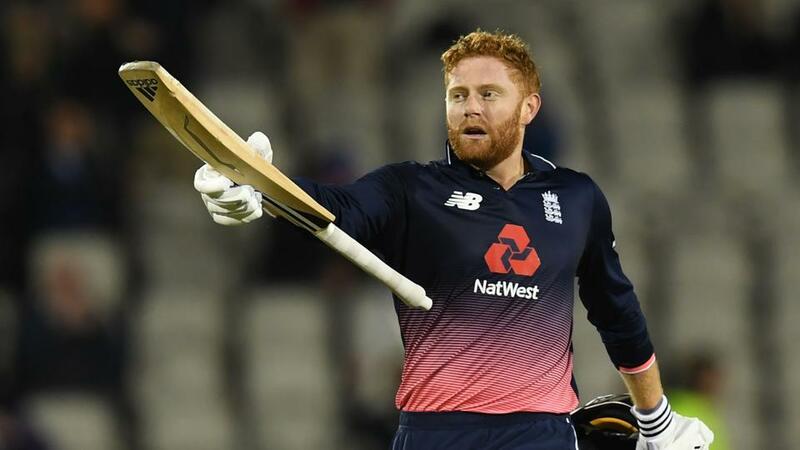 Jonny Bairstow said he was delighted to have joined an “elusive club” after finally scoring his maiden one-day international ton as England beat West Indies by seven wickets in their series opener at Old Trafford on Tuesday. Bairstow finished on exactly 100 not out, getting to three figures six years after playing a winning hand on debut against India in Cardiff. That Tuesday’s match was just Bairstow’s 28th ODI is a reflection both of the difficulty he has had in establishing himself in the white-ball set-up and England’s uncertainty over how to best deploy the man now firmly established as their Test wicket-keeper in the 50-over game. But having brought in Bairstow as an opener in place of the struggling Jason Roy for their previous ODI, an eight-wicket Champions Trophy defeat by Pakistan in Cardiff in June, a match where the Yorkshireman’s 43 was a rare highlight for the hosts, they retained him as a specialist batsman at the top of the order on Tuesday, as Jos Buttler again kept wickets. The selectors’ decision was rewarded by an expertly-paced innings from Bairstow, who ensured England made light work of chasing down West Indies’ below-par total of 204 for nine in a match reduced to 42 overs per side by a wet outfield. “I’m really pleased,” said Bairstow, who put on 125 for the second wicket with Yorkshire colleague and England Test captain Joe Root (54). “It seems a long time ago since I made my debut at Cardiff,” added the 27-year-old son of the late former Yorkshire and England wicket-keeper David Bairstow. “I’m delighted to have scored my first one-day hundred for England. “There aren’t many people who’ve done it -- and to join that elusive club is something, when you make your debut at Cardiff against India, you want to do. Just over a month ago, Bairstow was dismissed for 99 during a Test against South Africa at Old Trafford. When he slipped going for a third run that saw him completed his 97-ball century on Tuesday there were, just briefly, fears he might once more be denied an international three-figure score at the Manchester ground. “When I slipped coming back for the third, I thought ‘Oh no, not again!’,” said Bairstow after England went 1-0 up in this five-match series with more than 11 overs left. Ben Stokes, in the middle when Bairstow made his maiden Test century, was also the Yorkshireman’s batting partner when he got to three figures on Tuesday. “He was in the middle when I made my first Test hundred, and he said ‘Don’t worry, I’m backing up for two on this one’,” added Bairstow. England white-ball captain Eoin Morgan praised Bairstow’s determination after being on the fringes of the ODI side for so long. “Being there at the end really epitomises how hungry he is and how much he wants to be part of the playing XI,” said Morgan. Defeat condemned two-time former champions West Indies to the indignity of qualifying for the 2019 World Cup in England. Once a promising opening stand of 45 between Chris Gayle and Evin Lewis ended, they found runs hard to come by. “We fell away badly in the middle (of the innings),” said West Indies batting coach Toby Radford. “I thought England bowled well, their usual tactics with cross-seam into the pitch, and made life difficult. The series continues at Trent Bridge on Thursday.